By Brandon Mason, D.O., Jonathon Kirkland, D.O., Donald von Borstel, D.O. 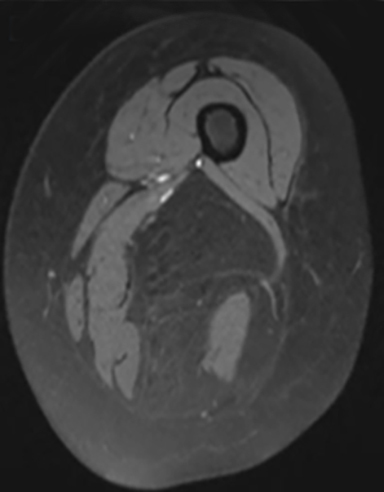 A 49-year-old woman presented with a 1-year history of a painless mass growing in her right posterior thigh. On physical examination, a palpable soft-tissue mass, which increased on follow-up visits, was noted in the posterior thigh. The patient had progressive discomfort without neurovascular symptoms. Over the course of the year, she had an ultrasound of the mass, and it was diagnosed as a likely benign lipoma. She was subsequently referred for MRI of the thigh with and without contrast to further characterize the mass. A soft-tissue mass in the appendicular skeleton can be a concerning clinical finding, although most soft-tissue lesions in extremities are benign. Ultrasound can be used as a first-line imaging tool to determine the anatomical location of the mass and the primary type of tissue involved. MRI is the gold standard imaging tool to determine the tissue composition, as well as additional important imaging characteristics, including enhancement pattern and involvement of adjacent soft tissues and compartments. If the soft-tissue mass has concerning clinical characteristics or a malignant appearance on imaging, biopsy or resection is indicated for definitive diagnosis. Well-differentiated liposarcoma (atypical lipomatous neoplasm) is most common in the extremities and retroperitoneum. They have a slight male predominance and usually occur in the fifth decade of life. Patients typically describe a slow-growing soft-tissue mass that only becomes painful or symptomatic when the tumor becomes very large. On gross pathologic examination, the specimen is typically well-circumscribed, soft, and lobulated. Areas of fat necrosis may be seen in large lesions. Histologic characteristics show mature adipocytic cells, atypical stromal cells, and scattered lipoblasts.1 The lesion demonstrates a positive MDM2 amplification by fluorescence in-situ hybridization (FISH)2 and overexpression of HMGA2 and the cyclin-dependent kinase CDK4. On radiography, internal calcifications may or may not be seen within the lesion. If the lesion is aggressive/high-grade, associated osseous erosions may be present. Ultrasound typically demonstrates a well-circumscribed and lobulated hyperechoic mass that is often difficult to distinguish from a lipoma. CT demonstrates a lobulated fat-attenuating mass with well-defined margins. The presence of internal septations and enhancement are variable. Osseous erosions can be seen in higher-grade lesions. 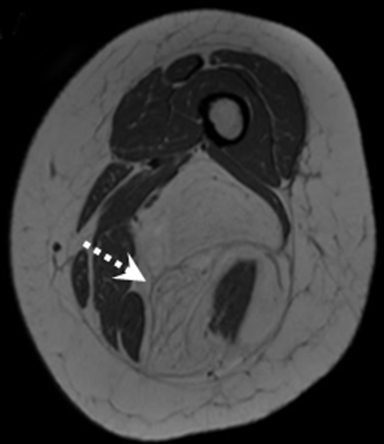 MRI demonstrates a well-defined and lobulated mass with an identifiable capsule. These masses are T1- and T2-hyperintense due to fat content with variable internal hypointense septations. Signal dropout is seen on fat-suppressed sequences. Variable internal septal enhancement is seen on T1-weighted, fat-suppressed postcontrast images. Treatment typically requires wide-margin resection of the mass with favorable outcomes. Postresection radiation therapy of the surgical bed has been utilized in some cases. A lipoma is a benign soft-tissue mass that makes up nearly 50% of all soft-tissue masses. On histology, they typically cannot be differentiated from normal adipose tissue.3 Lipomas are encapsulated, and the attenuation of the capsule is similar to muscle. Lipomas are typically smaller than a well-differentiated liposarcoma and are typically < 10 cm. A lipoma will commonly show homogeneous fat attenuation on CT and fat signal intensity on all MRI pulse sequences. Small septations, < 2 mm thick, may be noted within the lipoma and they may or may not display a peripheral capsule on imaging.3 Lipomas lack the typical thickened septations and internal enhancement that can be seen in more aggressive entities. Spindle cell lipomas are a benign form of lipoma that are typically seen in the superficial soft tissues. Spindle cell lipomas have a male predominance and are typically diagnosed between 45 to 65 years of age. These lesions predominantly occur in the posterior neck, shoulder, and back.4 Spindle cell lipomas typically demonstrate increased heterogeneity on imaging (CT and MRI) in relation to lipomas and well-differentiated liposarcoma. This is due to internal areas of nonadipose tissue, which are typically present at a greater ratio compared to an atypical lipomatous neoplasm. Spindle cell lipomas commonly demonstrate avid enhancement of the nonadipose tissue on postcontrast CT and MRI. 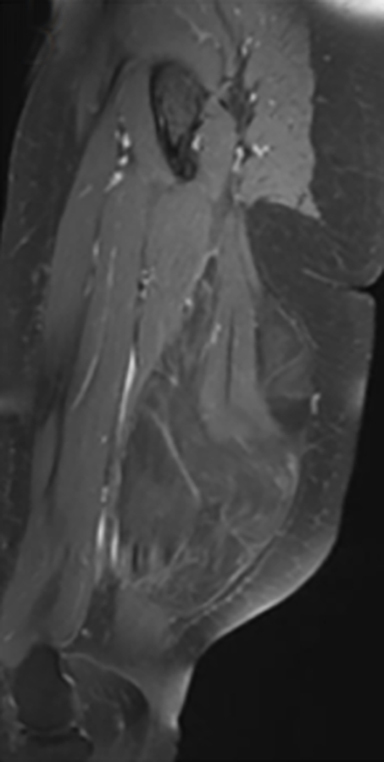 MRI is important in the imaging workup and management of patients with a soft-tissue mass in the appendicular skeleton. The primary role of MRI is to determine tissue composition of the mass, enhancement characteristics, and relation of the mass to adjacent neurovascular and musculoskeletal structures. The differential diagnosis for a fatty soft-tissue mass in the appendicular skeleton includes a well-differentiated liposarcoma, lipoma, and spindle cell lipoma. The MRI characteristics of these lesions help determine the appropriate follow-up and whether surgical resection is warranted. Brisson M, Kashima T, Delaney D, et al. MRI characteristics of lipoma and atypical lipomatous tumor/well-differentiated liposarcoma: retrospective comparison with histology and MDM2 gene amplification. Skeletal Radiol 2013;42(5):635-647. Clay MR, Martinez AP, Weiss SW, et al. MDM2 amplification in problematic lipomatous tumors: analysis of FISH testing criteria. Am J Surg Pathol 2015;39(10):1433-1439. Kransdorf MJ, Bancroft LW, Peterson JJ, et al. Imaging of fatty tumors: distinction of lipoma and well-differentiated liposarcoma. Radiology 2002;224(1):99-104. Bancroft LW, Kransdorf MJ, Peterson JJ, et al. Imaging characteristics of spindle cell lipoma. Am J Roentgenol 2003;181(5):1251-1254. Mason B, Kirkland J, von Borstel D. Large Fatty Soft-tissue Mass. J Am Osteopath Coll Radiol. 2018;7(3):31-32. Brandon Mason, D.O., Jonathon Kirkland, D.O., Donald von Borstel, D.O.